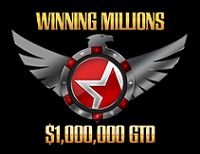 Americas Cardroom has announced Winning Millions, a $1 million guaranteed poker tournament set to get underway on December 14th, 2014. The historic online poker tournament will feature the single biggest online poker prize pool U.S. players have seen since April 2011. Qualifiers for the $500+$40 buy-in tournament will be available soon. Winning Millions is a Texas Hold'em tournament featuring a $500+$40 buy-in, scheduled for December 14th, 2014. It features a $1 million guaranteed prize pool, but the final number could grow even bigger given Americas Cardroom's history of eclipsing their guaranteed tournaments. Thanks to the fastest payouts in the industry, easy deposits, and a tournament schedule that puts players first, Americas Cardroom has continued to attract new players to their community in record numbers. The $1 million tournament announcement is likely to push traffic at Americas Cardroom to new heights, ultimately leading to bigger prize pools in other tournaments as new players join the community. The first place finisher will take home $200,000 guaranteed, and Americas Cardroom is doing everything they can to push more players into the tournament. While the satellite schedule has yet to be finalized, over 600 satellites will lead to seats in Winning Millions.